Recent data highlight the role of the proximal tubule (PT) in reabsorbing, processing, and transcytosing urinary albumin from the glomerular filtrate. Innovative techniques and approaches have provided exciting insights into these processes, and numerous investigators have shown that selective PT cell defects lead to significant albuminuria, even reaching nephrotic range in animal models. Thus, the mechanisms of albumin reabsorption and transcytosis are undergoing intense study. Working in concert with megalin and cubilin, a nonselective multireceptor complex that predominantly directs proteins for lysosomal degradation, the neonatal Fc receptor (FcRn) located at the brush border of the apical membrane has been implicated as the “receptor” mediating albumin transcytosis. The FcRn pathway facilitates reabsorption and mediates transcytosis by its pH-dependent binding affinity in endosomal compartments. This also allows for selective albumin sorting within the PT cell. This reclamation pathway minimizes urinary losses and catabolism of albumin, thus prolonging its serum half-life. It may also serve as a molecular sorter to preserve and reclaim normal albumin while allowing “altered” albumin to be catabolized via lysosomal pathways. Here, we critically review the data supporting this novel mechanism. Although the importance of urinary albumin in disease progression is known, the key mechanisms mediating the presence and toxic effects of albuminuria remain to be determined. Recently, the quantitative role of the glomerular filtration barrier (GFB) and the proximal tubule (PT) cell (PTC) in the development of albuminuria has been reexamined. Different lines of evidence, from multiple investigative teams, now suggest that the filtration of albumin, under physiologic conditions, is greater than previously determined. These data suggest an increased clinical role for the PT in minimizing albuminuria through the reabsorption of albumin. Emerging data also suggest that both glomerular permeability and PTCs play fundamental, physiologic, synergistic, interactive, and dynamic roles in the renal handling of albumin. Furthermore, it appears that PTCs, especially in the S1 segment, have specific mechanisms for efficiently and effectively reabsorbing and transcytosing albumin (reclamation). Therefore, the purpose of this review is to describe the emerging data regarding PTC albumin handling and provide a framework for considering future exciting, insightful, and novel studies with direct clinical relevance. This review is not intended to debate the important role of the GFB but to emphasize that the PT should be considered important both under physiologic and pathologic conditions. We believe that glomerular or PTC defects can and do result in proteinuria. Specifically, we outline current data supporting PT uptake of albumin and mechanisms of reabsorption and transcytosis, and we propose a mechanism for intracellular sorting between degradation and transcytotic pathways based on pH-dependent binding. For nearly 30 years albumin has been known to be reabsorbed by PTCs.1 Albumin is a 66-kD, 585–amino acid, negatively charged globular protein found in plasma of mammals. It is produced and excreted by the liver and is the most abundant protein in plasma. Its half-life is approximately 35–39 hours in rodents and an impressive 19 days in humans.2 Mammals have developed important cellular mechanisms for minimizing albumin turnover, thus enabling a long plasma half-life. Serum albumin is multifunctional as it buffers pH; provides oncotic pressure; and is a carrier protein for a wide range of molecules, including amino acids, fatty acids, inorganic ions, medications, and metabolites.3,4 Preventing or reducing urinary albumin excretion thus makes the kidney a key player in “protecting” the organism from excessive loss of albumin and its ligands. Albumin loss in urine has long been used as a marker of kidney injury, whether it originates from glomerular dysfunction, defective PT reabsorption, or a combination. Albumin filtration across the glomerulus is greater than previously thought and reclaimed by the PTC, especially S1 cells. (A) Albumin filtered at the level of the glomerular capillaries into the Bowman space is taken up after binding by the megalin-cubilin receptor complex or perhaps by the FcRn lining the brush border of proximal tubular cells. Albumin is internalized to PTCs by receptor-mediated endocytosis via clathrin-coated vesicles and fluid-phase endocytosis. From there it can be catabolized via lysosomal degradation or can be transcytosed. Albumin fragments in the urinary lumen result from lysosomal exocytosis or peptide hydrolysis by apical membrane proteases. (B) In vivo image of 25-micron three-dimensional volume showing amounts of Texas red–labeled albumin uptake into PTCs (arrow), especially the S-1 segment (S1). G, glomerular capillaries. Bar=20 µm. These recent studies with diphtheria toxin, by three independent groups, have emphasized the magnitude of filtered albumin by selectively injuring the PTC, thus causing global PTC dysfunction and allowing all filtered albumin to end up in the urine. Thus, activating the receptor with diphtheria toxin24–26 caused marked and sustained dose-dependent selective PTC injury that resulted in nephrotic range proteinuria. There remains considerable controversy around glomerular albumin permeability. Numerous techniques and experimental approaches have been used to determine the quantitative role of glomerular albumin permeability in albuminuria. Values for the glomerular sieving coefficient of albumin have ranged from <0.001 to 0.07 under various physiologic and pathologic conditions using different techniques.27 Of particular importance has been the use of Munich–Wistar (MW) rats that have surface glomeruli, allowing for direct dynamic visualization, instrumentation, and manipulation. MW Fromter (MWF) rats have many surface glomeruli, have been used in micropuncture studies, and spontaneously develop hypertension and progressive albuminuria beginning by week 8 and increasing to urinary albumin excretion>300 mg/24 hours by week 32. By week 40, 50% of glomeruli are sclerotic.28–30 The Heymann nephritis rat model has also been used to study urinary protein loss and was significant in identifying megalin, found largely at the apical membrane of the PTC, as an autoantigen in membranous glomerulopathy.31 MW Simonsen rats have fewer surface glomeruli and do not develop age-related spontaneous albuminuria under physiologic conditions. Mice unfortunately lack surface glomeruli, and therefore direct visualization methods cannot be performed, unless pathologic processes, such as ureteral obstruction for several days, are used.32 This results in formation of atubular glomeruli and extensive alterations and remodeling of PT and glomerular cells. 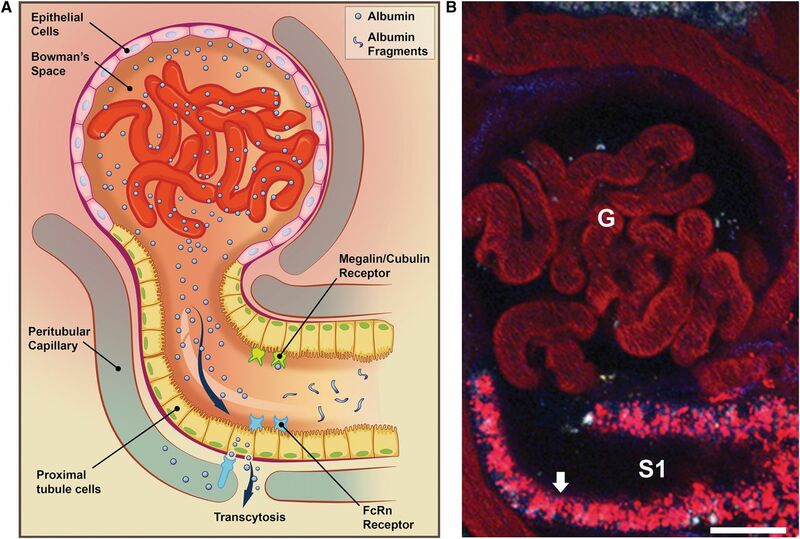 Controversy remains regarding the extent of glomerular filtration of albumin and similar-sized dextrans, used to model albumin filtration, as observed by two-photon microscopy. Detection of albumin in the glomerular filtrate requires maximizing the signal through use of the correct fluorescent probe, depth of study, site selection, detector sensitivity, and particular detail to background subtraction of existing autofluorescence.8,50 Work by Peti-Peterdi and Tanner using two-photon microscopy reported values significantly lower than we have published,51–53 which are closer to those from micropuncture studies. Peti-Peterdi and Tanner collectively pointed to multiple aspects of our studies as being causes for our elevated values. Addressing their points with data,8 we refuted these assertions. Of particular importance, our most recent publication points to photo-multiplier tube detector offset settings as the factor probably explaining the observed differences.50 These settings determine detector sensitivity and can cause variation in albumin permeability values spanning several orders of magnitude within the same glomerulus. Nakano et al.51 state in their Methods section that the detector offset was adjusted for each individual glomeruli to reduce nonspecific fluorescence (autofluorescence) before and after dye injections. This is a departure from textbook approaches to correctly adjusting detector settings.54 This approach was probably used to constrain tissue autofluorescence intensity to within the same low values derived from electronic detector noise; in fact, autofluorescence is a tangible phenomenon that when minimized by adjusting detector offset results in a progressively marked decrease in detector sensitivity. This lack of sensitivity is supported by a recent publication by Schießl and Castrop,55 which also reports very low permeability values for albumin. In their work, the offset values used in their background image (Figure 1B, blue warning marker indicating values at zero) are an identical match to offset values in our study50 showing decreased detector sensitivity to low-intensity fluorescence. A detailed method of our approach to determining GSC values can be found elsewhere.56 Therefore, it appears the filtration of albumin across the GFB is dynamic with regard to feeding, varies between rat species, and is probably greater than previously determined by micropuncture studies. The endocytic apparatus is found throughout the PT, although clathrin-coated pits and vesicles are notably fewer in the S3 segment.63 Expectedly, protein reabsorption and degradation are greatest in the S1 segment of the PTCs and least in the S3 segment.64–66 Kinetic studies of the rat PT have shown that internalization of cargo at the brush border is highly active. The membrane and trapped fluid (luminal fluid) contained in the apical membrane invaginations are internalized within 78 seconds.67 This rapid rate of uptake means a great deal of luminal fluid is internalized via endocytic vesicles and probably indicates an important role for fluid phase endocytosis. However, quantifying the overall importance of fluid-phase endocytosis has been difficult because all endocytic vesicles contain fluid and thus luminal contents. The megalin-cubilin receptor complex is well studied, and myriad reviews have described its function and role in protein absorption and metabolism.6,59,77,78 The dissociation constant (Kd) of albumin to cubilin is estimated at 0.63 µM at a pH of 7.0,5 resulting in a high-affinity, low-capacity pathway of endocytosis that primarily targets product to the lysosome for degradation. Subsequent lysosomal processing and trafficking of resulting amino acids back to the basolateral membrane for transport into plasma occur. Megalin and cubilin work in concert to reabsorb >40 filtered molecules.6,59,79–81 Without this mechanism of retrieval and preservation, protein loss, malnutrition, vitamin deficiencies, and other consequences would ensue. Although both megalin82 and cubilin5 can bind albumin, megalin’s principal role seems to be in catalyzing the retrieval and internalization of apical cubilin-albumin complexes from glomerular filtrate. Although not yet fully understood, the role of FcRn appears to be that of intracellular selection, sorting, and preservation of reabsorbed albumin and IgG. FcRn is concentrated into the apical area in the PT. Whether it participates in luminal albumin binding is not known, but this is not favored by the luminal pH. However, the megalin-cubilin–bound albumin within the clathrin-coated pits, and fluid-phase endocytosis vesicles undergo pH reduction to approximately 5.0. At the low pH found in endosomes, albumin dissociates from megalin-cubilin, while FcRn’s affinity to bind both IgG and albumin increases dramatically.90,91,100,115 Thus, albumin is capable of moving from a low-capacity lysosomal degradation pathway39,116,117 to a high-capacity pathway of transcytosis and recycling mediated by FcRn based on inherent binding properties of the receptors.39,118–120 Binding studies have shown that FcRn has a single binding site for albumin that is distinct from the IgG site and that both these interactions are pH dependent. The equilibrium dissociation constant, Kd, is much weaker at a pH of 7.0 (34–408 µM) versus a pH of 5.0 (0.2–0.7 µM).91 Consequently, if albumin is internalized while bound to the megalin-cubulin complex and is trafficked to the late endosomes, it encounters acidic pH and a “handoff” of albumin to the FcRn receptor can occur, thus directing it down the transcytotic pathway. When the transcytotic vesicle fuses with the plasma membrane and encounter neutral physiologic pH, a rapid dissociation of albumin from FcRn will occur, thereby releasing it to the interstitium and ultimately back into the circulation via the FcRn-mediated pathway in the endothelium.110,115,121 The FcRn receptor is recycled back to the apical membrane or apical compartment, ready for another cycle of albumin transcytosis. Of critical importance for albumin dynamics may be how modified albumins (i.e., glycated, carbamylated, and various drugs bound to albumin) affect the albumin–FcRn pH-dependent binding interaction. For instance, increased binding at a neutral pH or decreased binding at an acidic pH may both result in more targeting to lysosomes (Figure 2). FcRn mediates pH-dependent transcytosis and intracellular sorting of reabsorbed albumin. Albumin is reabsorbed via both receptor-mediated clathrin-coated pits into vesicles (CCV) (1a) and by fluid-phase (clathrin-negative) endocytosis (1b). Following endocytosis, endosomal acidification occurs (2), causing dissociation of albumin from receptors, such as megalin-cubilin complexes. However, acidification enhances albumin binding to FcRn throughout endocytic compartments; thus, there is exchange of albumin from the megalin-cubulin complex to FcRn. Within the endosomal-sorting compartment (ESC), albumin is directed toward lysosomal degradation or the transcytotic pathway (3). Transcytosis occurs by both vascular and tubular structures mediating albumin delivery to the basolateral membrane (4). Upon fusion with the basolateral membrane, the increase in pH of the extracellular environment causes dissociation of albumin from FcRn; FcRn is then recycled back to the apical membrane via the recycling compartment. It is possible that albumin’s binding to FcRn is reduced by alterations, such as glycosylation and carbamylation; thus, transcytosis of albumin would not occur and albumin would enter the lysosomal pathway. This would provide an intracellular molecular sorting mechanism to preserve physiologic albumin and facilitate catabolism of chemically altered albumin. FPV, fluid-phase vesicle; L, lysosome; RC, recycling compartment; TJ, tight junction. The first direct evidence for transcytosis of albumin came from PT microperfusion studies.1 Subsequent studies using transmission electron microscopy immunogold studies revealed albumin uptake across the apical membrane and release across the basolateral membrane of PTCs.7 Subsequent two-photon studies showed actual intracellular vesicles and tubules uniting with the basolateral membrane and releasing fluorescently labeled albumin into the interstitium.8 Finally, Tenten et al.9 showed that both negatively charged and neutral albumin released from transgenic podocytes was transcytosed from the filtrate into the blood. Furthermore, genetic deletion of the FcRn receptor in these mice abolished transcytosis of both types of albumin. These data prove FcRn is responsible for mediating albumin transcytosis in the PTC. However, the magnitude of this process remains to be determined. PT-specific FcRn was further implicated when FcRn knockout kidneys were placed in wild-type mice and serum albumin declined to 40%–50% of baseline over 3 weeks. Conversely, serum albumin increased as wild-type kidneys were placed in FcRn knockout mice.100 These data indicate the absence of FcRn results in increased urinary loss of albumin and enhanced catabolism. In PTCs, the lack of transcytotic pathway would shuttle all reabsorbed albumin into the degradation pathway. Further PT-specific studies are needed to more fully examine the exact role of FcRn within the kidney and its function in mediating transcytosis and preventing lysosomal degradation of albumin. Currently the role of the PTC in albumin reabsorption and reclamation is being rewritten. Numerous single-site alterations cause proteinuria, and complete PTC dysfunction results in a high level of albuminuria, without histologic or electron microscopy structural alterations in the GFB, implying a GSCA greater than previously believed. This has also been shown using intravital two-photon imaging. Reabsorption of filtered albumin involves a high-affinity, low-capacity megalin-cubulin receptor–mediated process and a low-affinity, high-capacity process that we believe is fluid-phase endocytosis. Data on the neonatal Fc receptor within the PT cell suggest that its principal function may be in pH-mediated binding, sorting and intracellular trafficking between transcytosis and degradation pathways. This latter function may be decided based on alterations in albumin binding at low pH to FcRn. Such a mechanism of selective processing and sorting would be evolutionarily critical in reclaiming normal albumin via transcytosis and in the lysosomal catabolism of chemically altered and potentially harmful albumin. Given the quantity of albumin reabsorbed daily, and the prolonged half-life of serum albumin, this is an absolutely essential process. Two-photon intravital studies to delineate the roles of altered GFB permeability, PTC endocytosis, and the intracellular trafficking of albumin are needed in the different animal models available to offer further insight into the renal handling of albumin. Additional reagents and approaches must be developed to allow assessment in human diseases. The authors acknowledge grant support to B.A.M. from the National Institutes of Health (DK 091623 and 079312) and support from the Veterans Administration through a Merit Review award. You are going to email the following The Proximal Tubule and Albuminuria: Really!